Athletics' annual awards ceremony has been cancelled by the sport's governing body in the wake of investigations into former president Lamine Diack. The World Athletics Gala was scheduled for Saturday, 28 November in Monaco. 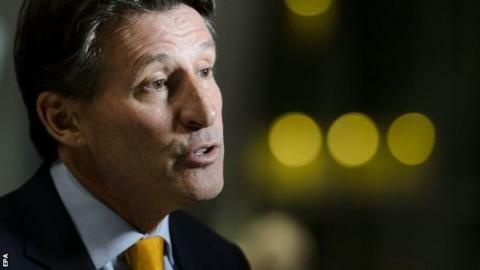 However, Lord Coe, president of the International Association of Athletics Federations, said: "This is not the time for the athletics family to be gathering in celebration of our sport." The male and female athletes of the year will now be announced online. Coe added: "We will rightly still honour the outstanding achievements of the sport's athletes. "Therefore the athlete of the year and other annual honours will still be awarded and will be promoted and announced on the internet and social media. "The IAAF will seek a suitable occasion in the future for the presentation of these awards to be made to the winners." British distance runner Mo Farah, who won the 5,000m and 10,000m double at the World Championships, is nominated for the athlete of the year award. Among others, Farah is joined on the list by Jamaica's Usain Bolt, who claimed the 100m and 200m sprint double in Beijing and Dutch sprinter Dafne Schippers, who won 200m gold and 100m silver. The gala is run by the IAAF's own charitable foundation and Coe had to ask the foundation to cancel it, as it is not under the IAAF's control. Diack remains under investigation by French prosecutors, with the 82-year-old under suspicion of receiving money in 2011 in return for deferring sanctions against Russian athletes who failed drug tests. Diack, who was IAAF president from 1999 to August of this year, is yet to comment on the allegations. Meanwhile, four men, including the son of former president Lamine Diack, have been charged by the IAAF with breaching its code of ethics.